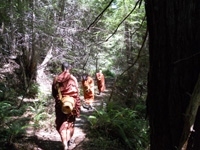 I write on behalf of our community to welcome you to join us for Bhikkhuni Camp just after Vesak this May at our Aranya Bodhi Forest Hermitage on the Sonoma Coast of Northern California. For those of you who have not been here before, our hermitage is off-grid on hundreds of acres of fairy-ring redwood, Douglas fir and Tan Oak forest just off the Pacific Ocean. The climate is normally warm and mild in May, the forest and meadows full of wildflowers. Seasonal rains normally end by the Vesak full moon, so this is the ideal time for camping. Our land is accessed by private road and comparitively very safe with regards both humans and forest wild life. Although our name is "Aranya Bodhi", it is not truly "aranya" or wilderness by Vinaya standards as we can see and hear our neighbors, although the atmosphere is very much one of great natural quiet and seclusion. We have a large monastic sima which cows cannot cross allowing women spaces of seclusion within the greater natural precincts of our monastic sanctuary. We would like to welcome elder (theri), middle years (majjhima) and new (nava) bhikkhunis, samaneris, anagarikas and monastic life aspirants to join us. For bhikkhunis and samaneris, this time will offer a rare and precious opportunity to come together for a few days as a community of recluses, to share and learn from one another. 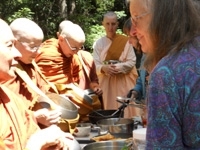 Ayya Tathaaloka, Ayya Sobhana, Ayya Thanasanti, Ayya Anandabodhi, Ayya Santacitta and others will have recently returned from a two week inter-traditional Vinaya Seminar at Sravasti Abbey--Life As A Buddhist Monastic Woman II. This will give us a chance to share in council with one another about what we as Theravada bhikkhunis learned during this time and how it may inform us. 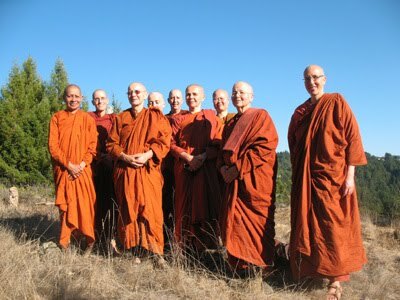 We may also have a special council together for those who are North American Bhikkhuni Association members, and the plans for this association. For aspirants, this may be a precious opportunity to be in the presence of and spend time with a wide variety of bhikkhunis from various backgrounds and far flung places. We would like to offer a short time each day with a few of the bhikkhunis and samaners and one council during the retreat time especially for monastic life aspirants to meet with a larger number of the bhikkhunis and be able to ask questions, discuss and reflect together. There is no charge to any participant. This gathering will be supported by the Friends of Dhammadharini and DharmaCreek. We welcome your support as well. This gathering is completely freely offered from a heart and space of generosity. If you personally (except bhikkhunis and samaneris) or your non-profit organization or support foundation is able to contribute, that is wonderful. If you are a friend of the Sangha and you would like to be a part of a support team of friends, just let us know and welcome. We do not know yet if travel assistance may be available through the Alliance for Bhikkhunis or Dhammadharini or not. This will depend upon whether there are donated funds designated for this purpose. Please do let them know if you would like to participate and are in need of such assistance. 25-26 May: Vesak All who would like to are welcome to join us for the weekend of Vesaka celebrations before our Bhikkhuni Camp, or for the week beforehand to help with preparations. Special Note: The Retreat at Spirit Rock Meditation Center co-led by Ayya Medhanandi and Ajahn Sucitto begins the evening of May 31st. 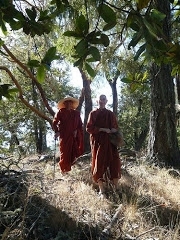 There will be a shuttle going from Aranya Bodhi Hermitage to Spirit Rock for retreatants, so there will be a comfortable and conducive segue for those who would like to come to California for both the Bhikkhuni Camp and the Spirit Rock retreat. All participants should bring their own camping gear and eco-friendly toiletries as we have very limited supplies at the hermitage. Please inquire for a list of useful gear to prepare and bring. If you would very much like to attend but are not able to stay in a tent, there will be a very small number of kuti spaces available. Please inquire about availability if such a space might enable your participation. Please do write to us at our hermitage at the email above for more information and to let us know if you would like to participate. I look forward to seeing and being together with all of you in this beautiful space of forest land so blessed and conducive for women's practice and liberation in the Buddha's Way.